I'm what's known as a "heavy user" of podcasts. Over the weekend I had to unsubscribe and then re-subscribe to every show I listen to. This took me two days. After investing so much time into that, I backed up the OPML file so that I wouldn't have to think so hard next time to remember the all the shows I subscribe to. Turns out it is 141 shows. And very good thing I did since later that day my podcatcher of choice, Overcast, removed the security certificate for the version I was using. A security certificate is important, very important, for an app which regularly checks online and then automatically downloads files, it's what gives the app the ability to do that. So, I woke up Tuesday morning in a state of panic since I had no podcatcher, no shows to listen to and was faced with the possibility of having to use the iPhone's native app to listen to shows. There was a time that was the only way I listened to shows, but now I just can't go back. 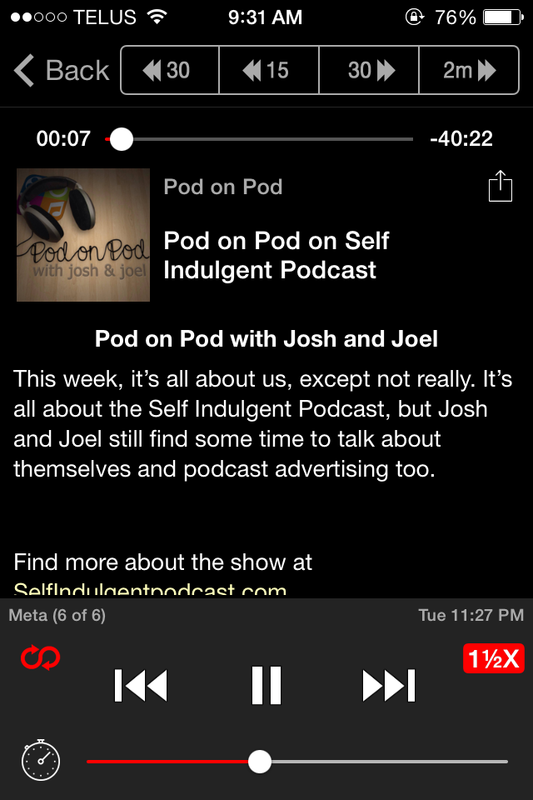 After asking around with other podcasters and podcast listeners, I settled on using Downcast. The idea of paying for an app before even seeing how it works also filled me with panic. What if I hate it? What if it doesn't do the basic stuff I need it to? As with most panic attacks, this was completely unnecessary. Of course it has the stuff I need. There are a billion free apps to listen to shows, one that actually costs money is going to be pretty damn good. Now that it's been two days of playing around with it I have some thoughts. Let's start with what I loved about Overcast, and miss. 1. Speed control - Overcast has a slightly more granular speed control than any app I've used. Listening at 2x the speed is a bit too fast for me, and listening at 1.5x the speed is a bit too slow. On Overcast I was able to set the speed at 1.75x, perfect. 2. Discovery - Overcast could be synced with my Twitter account. There was a great section called Twitter Recommendations. Anybody I was following on Twitter, who also used Overcast, could recommend shows or particular episodes and they showed up there. A year ago when I switched to Overcast I did not subscribe to 141 shows. I've found so, so many great shows that I love through the Twitter Recommendations section. 3. 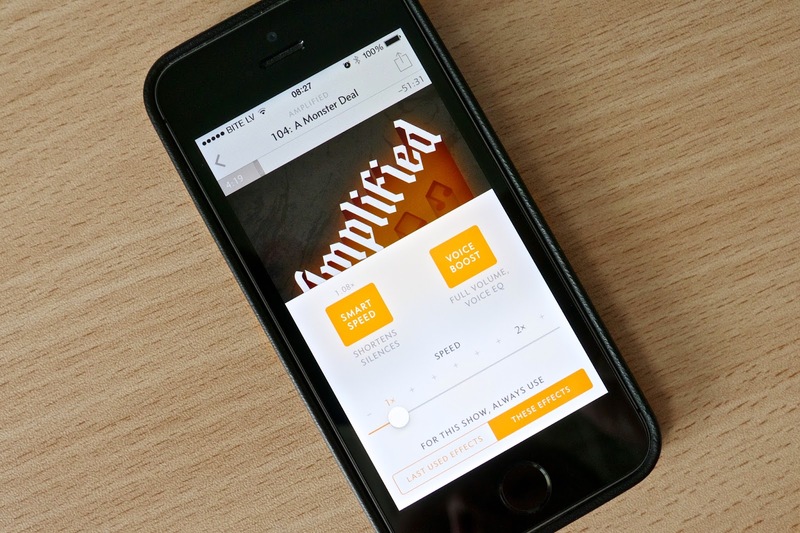 UI/Branding - It's silly, but orange is my favourite colour and I loved that my most often used app was bright white and orange and made me smile every time I looked at it. 1. 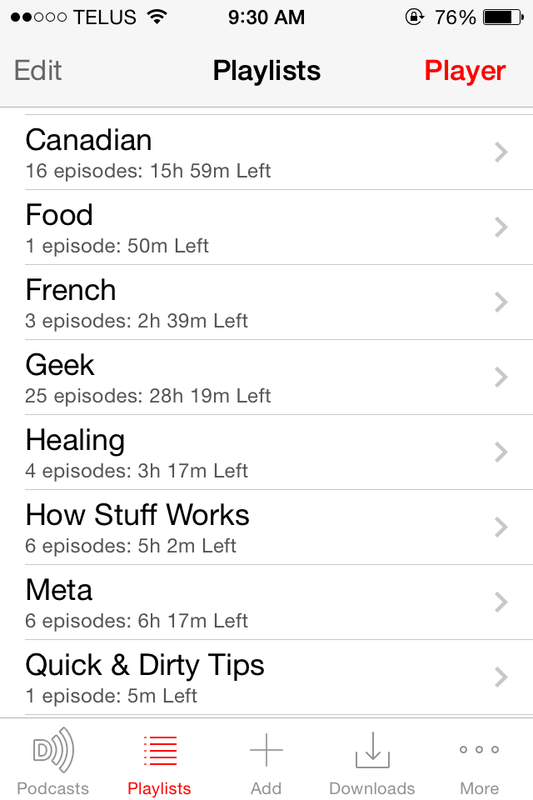 Playlist Sorting - I can sort the episodes in a playlist by a much wider variety of choices. Typically I sort by date, but I've found that Downcast let's me sort by Time Left, which I love. Some shows are 7 minutes, some are 3 hours. Some days I want variety and some days I want to spend with only one or two people. Sorting by time lets me hit play at the top of the list and listen to 10 different shows and different voices without worrying about it how long I will spend with one person. 2. Cumulative Time Stamps on Playlists - I can tell that there are 6 new episodes in my Meta playlist and that it will take me 6 hours and 17 minutes to listen to them all. Of course I listen at 1.5x so it will probably only take me 4 hours or so. Some days I just want to listen to podcasts about podcasts and some days I just want to empty a playlist. Now I have an extra bit of info to help me make my decision. 3. RSS Feeds Work! - This is a very specific one. On Overcast every time I added the RSS feed, or the website address for Broken Area Podcast, it wouldn't recognize it. No idea why, just wouldn't. So when I, out of curiosity, entered it in the search field on Downcast, there it was, right away. So now, I can listen to Dave and Isabelle do groceries, and Jon review movies, and Isabelle talk about art. So that's it, some thoughts about what I miss and what I've found. I will add that the UI of Downcast is kind of ugly. It's cramped and has too much on the screen, and I'm not a fan of a grey or black background. But I'll get over that. I still love Overcast, and if I ever update my phone to iOS8 or upgrade to a 5 or 6 I will probably go back to it. What do you use to listen to your podcasts? What do you love or want to change about it?